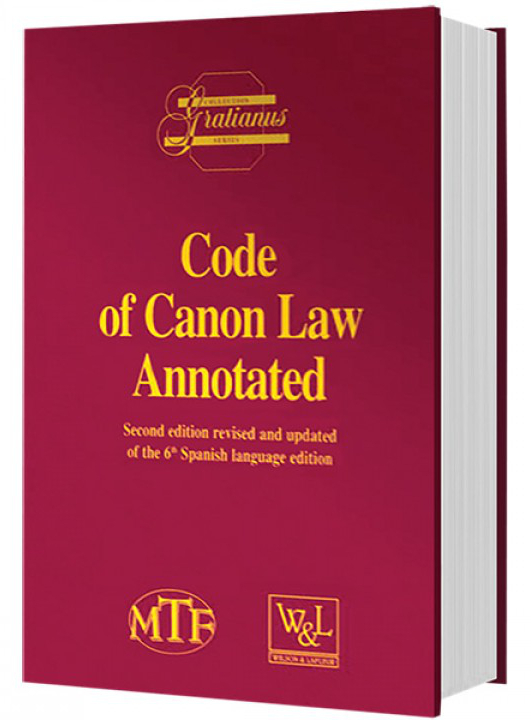 Code of Canon Law Annotated Second edition revised and updated of the 6th Spanish language edition. Woodridge, IL: Midwest Theological Forum, 2004. Prepared under the responsibility of the Instituto Martin de Azpilcueta. Edited by Ernest CAPARROS, Michel THERIAULT (+), JEAN THORN (+). 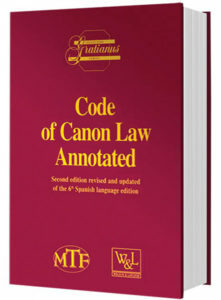 Second edition revised and updated of the 6th Spanish language edition. Edited by Ernest CAPARROS, Helene AUBE. Assisted by Juan Ignacio ARRIETA, Michael A. HACK, Jerome L. JUNG, David MOTIUK. Chapter II Cases Concerning the Separation of Spouses of Spouses. Can. 1692 — § 1. Unless lawfully provided otherwise in particular places, the personal separation of baptized spouses can be decided by a decree of the diocesan Bishop or by the judgment of a judge in accordance with the following canons. § 2. Where the ecclesiastical decision does not provide civil effects, or if it is foreseen that there will be a civil judgment not contrary to the divine law, the Bishop of the diocese in which the spouses are living can, in the light of their particular circumstances, give them permission to approach the civil courts. § 3. If the case is also concerned with the merely civil effects of marriage, the judge is to endeavor, without prejudice to the provision of § 2, to have the case brought before the civil court from the very beginning. 1692 — Cases concerning the separation of spouses for any of the reasons established in cc. 1152-1153 are intended to determine and decide the effects inseparable from the essence of marriage. The Church has the right to judge cases arising from marriages between baptized persons, although in some cases the spouses may be allowed to resort to the civil tribunal (§§ 2-3), especially when the effects are merely civil, and therefore separable from the essence of marriage. (cf. § 3). 2) Judicial: the case must be pursued before the competent judge or tribunal, as established in c. 1673 and to which c. 1694 refers. The case is heard either according to the oral contentious procedure or the ordinary contentious one, whichever is appropriate (cf.c. 1693, § 1). Paragraphs 2 and 3 consider some cases where the spouses, after obtaining authorization from the diocesan bishop of their place of domicile, bring their case before the civil forum. Since divorce laws have proliferated in many countries, the need to request the diocesan bishop’s authorization is a necessary precaution, which prevents the fostering of trials whose judgments [(Mary’s Advocates’ note) government civil court judgements] violate precepts of divine law, to the detriment of the spouses and with the risk of scandal to others. Can. 1693 — The oral contentious process is to be used, unless either party or the promoter of justice requests the ordinary contentious process. § 2. If the ordinary contentious process is used and there is an appeal, the tribunal of second instance is to proceed in accordance with can. 1682 § 2, observing what has to be observed. 1693 –If the plaintiff has presented a request for a separation judgment from the competent tribunal or the diocesan bishop and, if it is decided that a trial should take place, the oral contentious process should be used unless one of the parties requests an ordinary contentious trial. In our opinion, this second possibility might give rise in some cases to unnecessary delay in the resolution of the case, although it is intended to satisfy the lawful interest of the parties. Paragraph 2 enables the appeal to be pursued according to c. 1682, when in the first instance the case was heard according to the ordinary contentious trial; if the oral contentious process was used, the norms of cc. 1628-1640 governing appeals are to be followed. There seems to be a certain mistrust of the oral contentious process which, in this type of case, provides sufficient safeguards of justice. Can. 1694 –In matters concerning the competence of the tribunal, the provisions of can. 1673 are to be observed. Can. 1695 — Before he accepts the case, and whenever there appears to be hope of success, the judge is to use pastoral means to induce the spouses to be reconciled an to resume their conjugal life. 1696 — The legislator insists again that all necessary pastoral means be used to bring about a reconciliation, when the judge considers that the circumstances of the case make this possible. It should be recalled, however, that these cases affect the public good (c. 1696) and, consequently, neither a settlement in the strict sense nor a promise to abide by an arbitration award are allowed (c. 1715). Can. 1696 — Cases of separation of spouses also concern the public good; the promoter of justice must, therefore, always intervene, in accordance with can. 1433. 1696 — By their very nature, cases of separation of spouses have definite repercussions, not only on the spouses themselves, but also on society as a whole since the decisions in these matters always have tangible effects on the family and, in particular, on the children. This is why the intervention of the promoter of justice is also prescribed, as the legal guardian of the public good. The significance of the failure of the promoter to intervene is explained in c. 1433, to which the canon refers. To upholding True Marriage, we need your help. $1420 remaining in the monthly goal. Otherwise, proactive outreach will slow way down after April 28 when I look for another job. $3800 is total monthly goal regularly. Bai Macfarlane, Mary’s Advocates. We are a 501(c)(3) non-profit.